In Natural Feasts, Ella Mills makes it easy to prepare delicious food for you, your friends and family, for any event. No more wondering whether certain dishes go together or how you can provide delicious, plant-based meals that won't leave your guests craving what isn't good for them, Ella makes life simple with her menus—whether you are planning a laid-back brunch, a last-minute lunch, or a fancy dinner, she has it covered with hearty recipes that celebrate her natural eating philosophy. This gorgeous book also showcases more than one hundred full-color photographs, beautifully illustrating that clean eating and entertaining are a perfect match. When conventional medicine failed her, Ella overcame a rare, devastating illness by switching to a plant-based diet. With no formal culinary training, she began developing her own recipes and blogging about her journey. She’s a self-taught cook. She’s approachable. She inspires people. 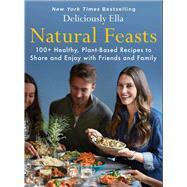 Now Ella shares her personal ideas and recipes for every foodie occasion, from cozy nights alone to easy kitchen suppers, flavorsome feasts, birthday parties, picnics, and mocktails and cocktails. Deliciously Ella with Friends is the go-to book for anyone who wants to make simpler, healthier food choices—for themselves and their friends and family.